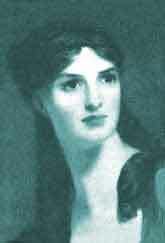 Frances Anne 'Fanny' Kemble (1809 - 1893), famous actress and author. "The most intense curiosity and excitement prevailed, and though the weather was uncertain, enormous masses of densely packed people lined the road, shouting and waving hats and handkerchiefs as we flew by them. We travelled at 35 miles an hour (swifter than a bird flies). When I closed my eyes this sensation of flying was quite delightful." "I had been unluckily separated from my mother in the first distribution of places, but by an exchange of seats which she was enabled to make she rejoined me when I was at the height of my ecstasy, which was considerably damped by finding that she was frightened to death, and intent upon nothing but devising means of escaping from a situation which appeared to her to threaten with instant annihilation herself and all her travelling companions." "When we neared Manchester the sky grew cloudy and dark, and it began to rain. The vast concourse of people who had assembled to witness the triumphant arrival of the successful travellers was of the lowest orders of mechanics and artisans, among whom great distress and a dangerous spirit of discontent with the government at that time prevailed. Groans and hisses greeted the carriage, full of influential personages, in which the Duke of Wellington sat." "High above the grim and grimy crowd of scowling faces a loom had been erected, at which sat a tattered, starved-looking weaver, evidently set there as a representative man, to protest against the triumph of machinery and the gain and glory which the wealthy Liverpool and Manchester men were likely to derive from it."